i armed myself with 3 confinement cook books (+ bookmarked a couple of websites with confinement receipes) this time round since i anticipated no help whatsoever but until now, i have not really had the chance to use them. i've had someone bring me food (almost) every day. i feel really pampered and blessed to have so many who care for me (and my stomach). interestingly though, i do not really feel hungry even though i am nursing two. nevertheless, i enjoy slurping the soups (though they makes me perspire profusely each time) & yummy food that have been lovingly prepared by my mom (actually her helper), my mil (actually also the helper) and even my sis' mil (herself)! without a doubt, my life has changed drastically - from the mom of a 2 yr+ toddler to a mom with a newborn & a 2 yr+ toddler. i have to work on my daily schedule from scratch - fitting in the newborn's feeding & sleeping timing with #1's schedule. fortunately, #2 has been good so far - he feeds well (bfing seems easier with subsequent children) and sleeps well - hopefully, it stays this way. or rather 2! it was really nice to have company after being 'confined' for the past couple of days... yes, I didn't stay in all the time (went grocery shopping, went over to my mom's place, etc etc) but it is nice to have some decent adult conversation (although it revolved around our children) while being stuck at home. thanks for visiting and I'd love to have more company anytime! With God's grace & blessings, we welcome #2 to our family on 10 Aug 09 (lunar birthday: 20th day of the 6th month) - 0501hrs. Chace (meaning: Hunter) weighed 3680gm and measured 54cm at birth. 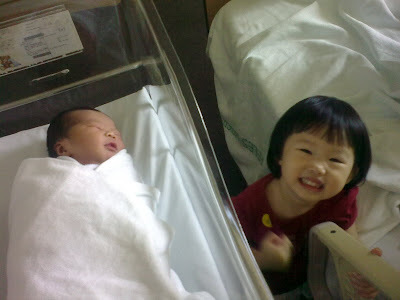 see how happy Claire is, with her new sibling!